There are 12 Assisted Living Facilities in the Jupiter area, with 4 in Jupiter and 8 nearby. The average cost of assisted living in Jupiter is $3,724 per month. This is higher than the national median of $3,346. Cheaper nearby regions include Tequesta with an average starting cost of $3,575. To help you with your search, browse the 121 reviews below for assisted living facilities in Jupiter. On average, consumers rate assisted living in Jupiter 4.6 out of 5 stars. Better rated regions include Royal Palm Beach with an average rating of 4.7 out of 5 stars. Caring.com has helped 6 families in Jupiter find high-quality senior care. To speak with one of our Family Advisors about assisted living options and costs in Jupiter, call (855) 863-8283. Jupiter, named by Coastal Living magazine as one of the Top 10 Happiest Seaside Towns in the USA, is located on the east coast of Florida in the northern part of Palm Beach County. With over 22 percent of the population ages 65 and over, Jupiter has a large and active senior community. There are four assisted living facilities within Jupiter's city limits and an additional 26 in nearby cities such as Palm Beach Gardens, Tequesta and West Palm Beach. The state licenses several types of facilities, and the services they offer are based on their license. The cost of living in Jupiter is 25 percent higher than the national average, fueled mostly by housing, which is a whopping 66 percent higher than the U.S. median. This is reflected in the city's $3,925 average monthly assisted living costs. Jupiter is a relatively safe town, with 2.37 incidents of violent crime per 1,000 residents per year. By comparison, the state average is 4.3, and across the country, it's 4. Seniors moving from out of state may find they have extra spending money in Jupiter. Florida does not impose a state income tax on residents, and that includes retirement income like social security and pensions. There is a 7 percent sales tax on most purchases, though. Jupiter offers a host of activities for its resident seniors. With supervised trips to the Kravis Center, casinos and shopping in addition to dances, leisure activities and referral services, there's no shortage of things to do. The American Lung Association grades counties on their air quality, including the number of high-ozone days and particle pollutants. Palm Beach County received grades of B and A, respectively, which means the air shouldn't worsen respiratory conditions. Summers are long, hot and humid in Jupiter. High temperatures reach the upper 80s and 90s throughout most of the year. Winters are short and mild with lows in the 50s. The town receives about 50 percent more rainfall than the U.S. average, often in the form of quick thunderstorms. Assisted Living costs in Jupiter start around $3,724 per month on average, while the nationwide average cost of assisted living is $4,000 per month, according to the latest figures from Genworth’s Cost of Care Survey. It’s important to note that assisted living rates in Jupiter and the surrounding suburbs can vary widely based on factors such as location, the level of care needed, apartment size and the types of amenities offered at each community. 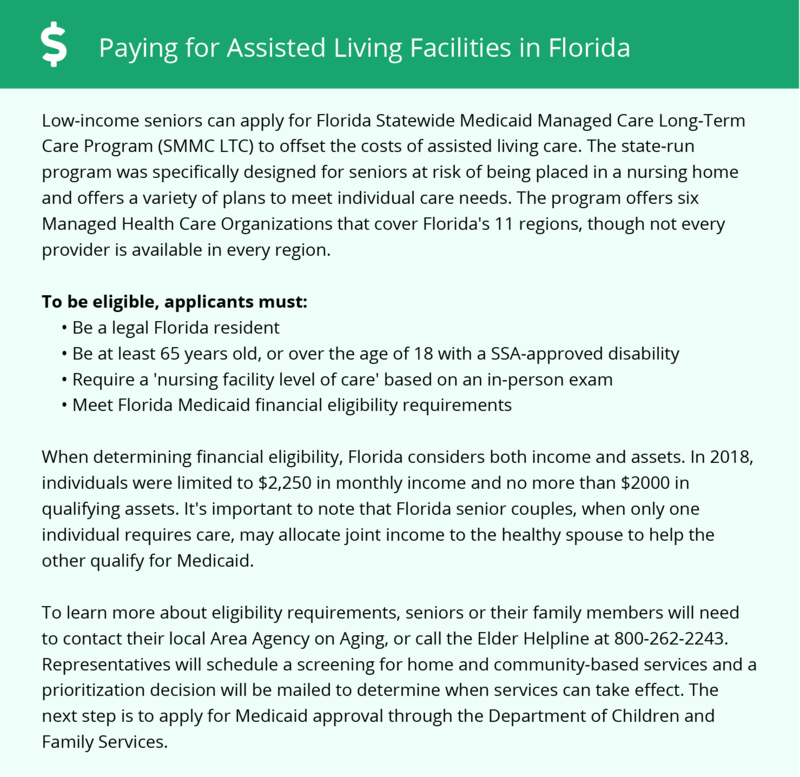 Florida's Medicaid Long-Term Care and Assistive Care Services programs help low-income seniors pay for services at assisted living facilities. The MLTC plan also negotiates room-and-board costs on behalf of participants. For those receiving Federal SSI benefits, Florida provides optional state supplementation that can help with additional costs, and the state lets families supplement benefits as long as the funds are paid directly to the provider. Jupiter and the surrounding area are home to numerous government agencies and non-profit organizations offering help for seniors searching for or currently residing in an assisted living community. These organizations can also provide assistance in a number of other eldercare services such as geriatric care management, elder law advice, estate planning, finding home care and health and wellness programs. To see a list of free assisted living resources in Jupiter, please visit our Assisted Living in Florida page. Jupiter-area assisted living communities must adhere to the comprehensive set of state laws and regulations that all assisted living communities in Florida are required to follow. Visit our Assisted Living in Florida page for more information about these laws.